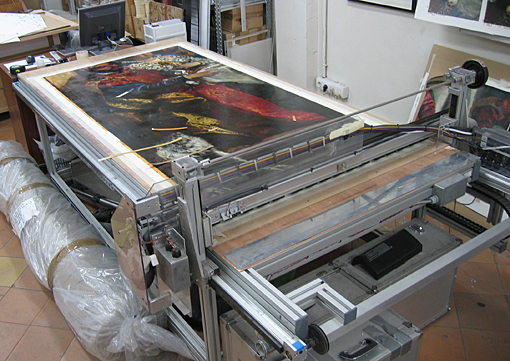 Factum Arte, based in Madrid (with studios in London and San Francisco as well), developes high rez 3-D scanners that are used to reproduce artworks in minute detail using historically accurate materials and paints. The company was founded by Adam Lowe and Manuel Franquelo, both painters themselves. Their amazingly accurate duplicative powers have been utilized in the name of preservation, as with their first project, in 2001, to recreate the Paleolithic paintings in Spain’s Altamira cave that had been forced to close to the public, 1977, in order to spare further carbon dioxide erosion. But the studios, have also been used to collaborate with just about every big name in 3-D art installation and sculpture in the contemporary art world, including: Marc Quin, Anish Kapoor, Urs Fischer, Jeff Wall, and Louise Bourgeois. One of Factum Arte’s most successful collaborations was the 2009 installation by filmmaker, Peter Greenaway , projected onto a facsimile of Paolo Veronese’s Wedding at Cana. The performance at the Palladian Refectory of San Giorgio Maggiore, which formerly housed the original painting, was a great success. Factum Arte’s copy of the painting has stayed with San Giorgio Maggiore, while the original is in the Musée de Louvre where Factum Arte had to scan it in situ in order to create their reproduction.